One of the biggest failing a comic can have is to waste an issue with meaningless philosophy and pointless scenes. 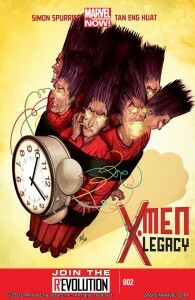 That was one of the big problems with issue one of X-Men Legacy. This second issue acts more like an issue one by introducing David to the audience, exploring a basic conflict, and by hinting at what is yet to come. We still slip between David’s mind prison and the real world, but now it is better explained and it has an impact on the events of the story. The story mostly focuses on David dealing with his extra personalities while also dealing with a dirty-mouthed being that is attempting to guide him. 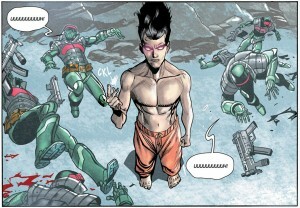 The issue concludes with David standing up and deciding what he wants to do with his life. Once again, the writing is terrible. David slips in and out of his accent, the grammar used in this book breaks many rules, and the X-Men that appear are written like jerks. The story moves forward at a decent pace, but the dialogue is terrible and the character interactions feel disjointed. It reads like everyone is talking to themselves rather than having a conversation. When David is alone this is fine, but when the other X-Men are acting this way or when the nameless entity acts this way it sounds wrong. 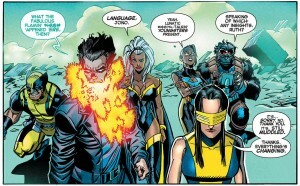 I also do not like how the X-Men characters that appear are very rude with way too much swearing. While swearing in a story is fine, it feels like it is there to show how “edgy” this story is rather than being written because it is a product of the situation. Much of the dialogue feels manufactured to be “dark” or “rough” none of it feels natural in this story. The biggest saving grace of this issue is the artwork. While issue one looked a little rushed at times, this issue looks much cleaner making this an easier story to read through. The mind prison sequences are once again well done and feature some crazy looking creatures. The real world looks a little better than the previous issue, but some background characters and locations are a little sloppy. Despite some flaws the art does look better and it will likely improve as this comic continues. 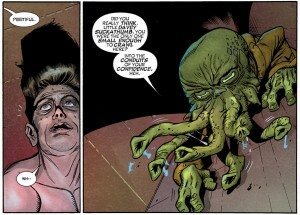 Issue one was a complete failure and if not for the artwork in the mind prison scenes it would have been a zero. This issue has some improvements and feels like an issue one, while last issue feels rushed and plays out like a poorly conceived issue zero. This series is one of the worst starts to an X-Men series that I have ever read. This issue was much easier to read, but Legacy is far from being a good comic. It is sad to see one of the early titles of the Marvel NOW line is this bad, thankfully there are plenty of good books in the line. I cannot recommend this book as the writing is terrible and although the art is improving it does not make up for the atrocious script. It is tragic that one of my favorite comics has a return in the form of this mess.